TYSON Fury is threatening to pull out of his world heavyweight title fight against Wladimir Klitschko because the canvas in the ring is too soft. “They need to change it. 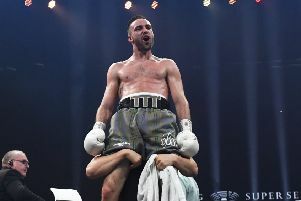 If they don’t change, then we have a problem,” Asif Vali, Fury’s agent, told The Associated Press hours before tonight’s fight at a 55,000-seat soccer stadium in Duesseldorf. The undefeated Fury (18 knockouts in 24 bouts), a former British, Irish, European, and Commonwealth champion, is bidding to end Klitschko’s heavyweight reign and take the Ukrainian’s WBA, IBF and minor WBO and IBO belts. The 39-year-old Klitschko, whose record is 64 wins with 53 knockouts from 67 fights, weighed in at 111.5 kilos (246 pounds) on Friday, giving Fury a slight advantage at 112 kilograms (247 pounds). Fury, at 2.09-meters (6-foot-9), is also taller than the 1.98-meter (6-foot-6) Klitschko.